Without a doubt, you or someone else you know has tried to re-purpose their kitchen cabinets by painting them – with terrible results. You know how they look; paint lines, drips, uneven paint, and chipping within a few weeks. When the chipping begins, the cabinets will look worse than they did before you decided to paint them. But, there are ways to paint your cabinets that can give your kitchen a fresh new look, and make it seem like you had a professional painter come in to do them! In this DIY Reviews article, part of our Home Improvement section, we will show you how to transform your kitchen in a few days – with a little hard work and planning. When you are removing your cabinet doors, make sure to place the screws and hardware in one place so you won’t lose any of them. We suggest a ziploc baggie. Don’t try to save time by not removing ALL of the hardware because you won’t be happy with the results. Sand down the doors and remove any patches or rough spots. Don’t go crazy with this step – you just want to get rid of any areas that may not be smooth. After sanding, wipe the doors thoroughly to remove dust. This is probably the most crucial step in making sure your cabinets look fantastic when finished! Even if you are a clean freak, your cabinets will have a buildup of grease and residue on them. You will to make sure you remove it all and use a cleaner with a de-greaser. You can also use denatured alcohol, but it does have strong fumes and you need to be in a well ventilated room or outdoors. 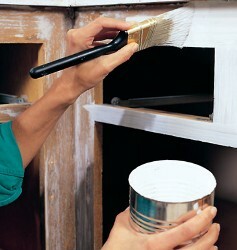 Applying primer-sealer will eliminate the need to degloss or completely sand down the wood before painting. With a foam brush, apply primer-sealer to the doors following the grain of the wood. You should start in the center and work outwards with a smooth motion. Primer will dry in about an hour or so. *If you have a spray gun, you can apply the primer with that instead. You will also need to prime the wall and base of each cabinet or drawer. There is no need to prime or paint the inside of the cabinets. This is not a step that can be rushed and you can expect it to take more than a day to achieve a nice, even finish. You will apply your paint just like you did the primer – start in the center and follow the grain. Start by applying a very thin coat allow it to dry for 4 hours. Then move on to the 2nd and 3rd thin coats – allowing 4 hours to dry between each coat. *Although you don’t need to paint the inside of the doors, it will make your cabinets look very finished. If you decide to go this route, make sure allow ample drying time on the front of the cabinets before painting the inside. Or, you can do the inside first. After you have painted all of the cabinet doors, you will need to paint the cabinet bases. You will follow the same directions as the doors. *Again, you don’t need to paint the entire inside of the cabinets, just the 1″ or so base on the inside. Make sure that you have allowed your cabinet doors to dry for a full 24 hours before you start re-attaching them. This will assure you can handle them and attach the hardware more easily. *If you have decided to change the hardware to something new, make sure you have aligned the drill holes and you know they will work before you start re-attaching the doors. Painting your kitchen cabinets can be a time consuming DIY project, and if you don’t think you are up to the challenge, then by all means you should contact a painting contractor in your area. 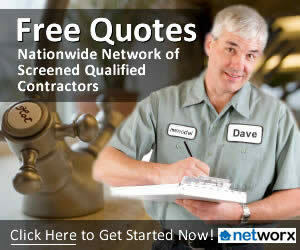 Make sure you know the right questions to ask before you hire a painting contractor for the job. But if you plan well, have all of your supplies and take your time, you can transform your kitchen in a few days and add lots of value to your home! Have you recently repainted your kitchen cabinets? If so, share some tips with our readers by leaving a comment!